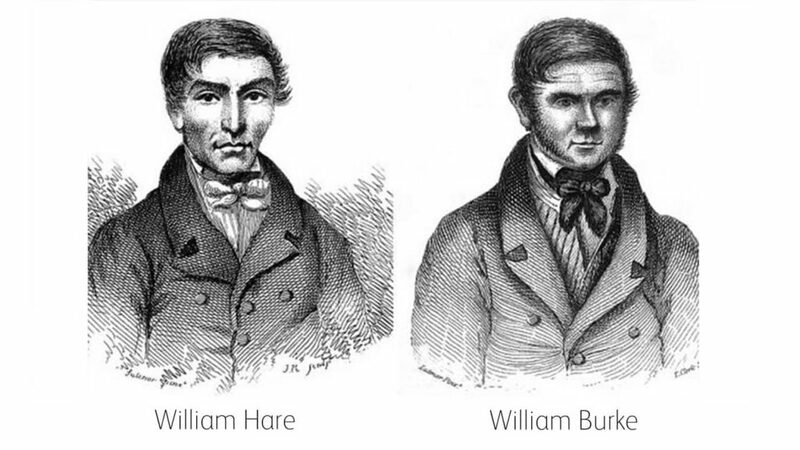 William Burke and William Hare were both born in Ireland and moved to Scotland in search of work. Short and hefty, Burke began a relationship with a prostitute called Helen McDougal and they settled in the Beggar’s Hotel in Edinburgh. In 1826 he met the tall, thin Hare and the two men moved to Log’s Boarding House in Tanners Close. Another resident, known as Old Donald, died still owing rent and Hare realized that a medical school would be willing to pay for the body, since dissection of corpses was illegal and thus fresh flesh was hard to come by. Old Donald’s coffin was filled with tan bark while his body was sold to anatomist Dr Robert Knox for £7 10s, £4 more than old Donald owed in rent. Another old tenant was despatched by placing a pillow over his face. The next murder by Burke and Hare was on 11 February 1828 when the pair killed Abigail Simpson. Having plied her with whisky, Hare suffocated her and Burke held down her legs. Dr Knox bought the two corpses. The next victim was a prostitute, Mary Haldane . On 9 April 1828 another prostitute, Mary Paterson, became their next victim. When they took the corpse to Knox he recognized Paterson because he had been one of her clients. If Knox realized how Burke and Hare came by their goods, he kept his own counsel. The killings came thick and fast, and included the slow-witted daughter of Mary Haldane who came to ask Hare where her mother was. Burke and Hare bought an old horse to help them transport the bodies but one day the horse refused to move while pulling a box containing corpses. They persuaded a porter to move the box on his barrow and Burke and Hare slit the throat of the horse. There is no record of how many people died at the hands of Burke and Hare but their last killing was on 31 October 1828. An old couple visited Log’s Boarding House and discovered the corpse. They went to the police who found blood and old clothes belonging to victims.